Aquamat 2000 is a company with many-years-experience and traditions in offering products for irrigation and developing of irrigation systems. 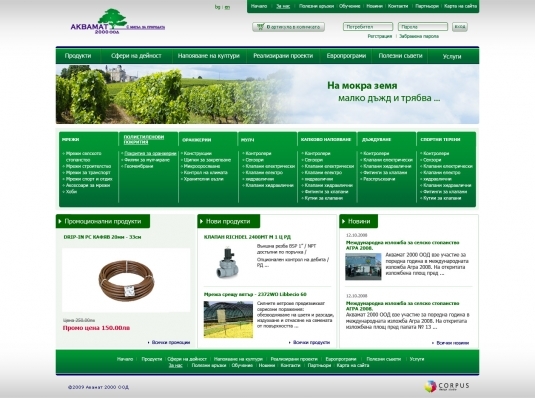 On the new web site the company presents rich assortment of products and services with detailed information for them. Indeed, this was a great challenge for Corpus Design Studio - when we had to create the web site, we had to figure out a structure, which will maximally facilitate the customers in their product catalog orientation. The opportunity to buy products and services online through the new company web site is another useful advantage for the clients.